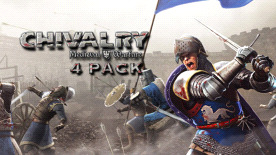 Includes four copies of Chivalry - Send the extra copies to your friends! Product offered subject to your acceptance of the Steam Subscriber Agreement ("SSA"). You must activate this product via the Internet by registering for a Steam account and accepting the SSA. Please see http://www.steampowered.com/agreement to view the SSA prior to purchase. If you do not agree with the provisions of the SSA, you should return this game unopened to your retailer in accordance with their return policy. ©2011 Valve Corporation. Steam and the Steam logo are trademarks and/or registered trademarks of Valve Corporation in the U.S. and/or other countries.